A man was rescued from a 30-foot motor boat that went up in flames Thursday morning as it floated in the placid blue waters between Bainbridge Island and the Kitsap Peninsula. The fire broke out about 6:45 a.m. after the man piloted his boat, the “Liberty Call,” out of the Brownsville Marina and was heading through Agate Passage, said a North Kitsap Fire Department spokesperson. A friend was following behind in another boat and was able to rescue the man as flames spread through the vessel. But the man was unable to get his dog off the boat, and it died in the blaze. The fire continued burning for some time before crews were able to reach it. Aerial footage shot by KOMO’s Air 4 showed the blaze burning fiercely and a tall column of smoke rising above it as it drifted through Agate Passage. The boat has continued drifting since northward the fire. It is still smoking, but the fire appears to be out. The vessel is considered a total loss. Recreational boating accidents are the most common cause of maritime injury and death. The National Transportation Safety Board reports that 672 lives were lost in recreational boating accidents in 2010 as opposed to a total of 61 lost in cargo transport, commercial fishing, and commercial passengers combined. It is unclear if the man in this story suffered any physical injuries. 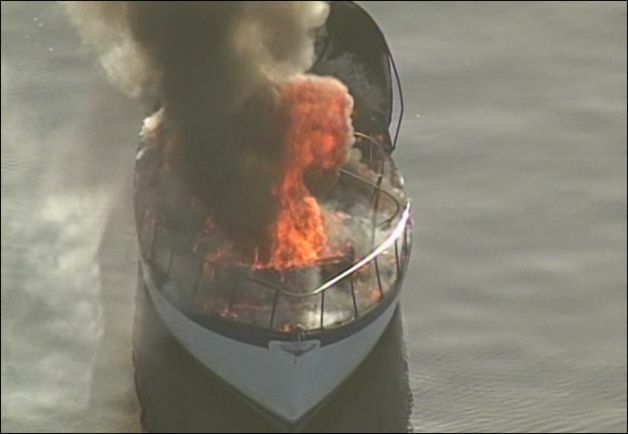 However, this case provides an example of where a boater may have a claim against a third party for damages suffered in the blaze. The facts currently available do not make clear what caused the fire, but where a vessel spontaneously bursts into flames, it is generally wise to investigate the cause to determine if there were any defective parts that caused the fire. If the fire was caused by defective parts or equipment, the boater may be entitled to recovery against the manufacturer.